Exterior doors from DuBois ABC Seamless are perfect for homes in Minneapolis or any nearby community in Minnesota. We have been helping homeowners upgrade their residences with quality, maintenance-free exterior renovations since 1980. 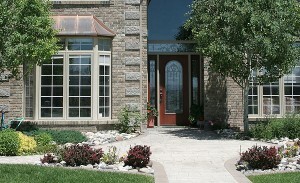 All of the products we sell and install are extraordinarily durable and will last the life of your home. Embarq™ – This fiberglass product is 43 percent thicker than most exterior doors, and is the most energy-efficient door available in the U.S.
Signet® – This door offers an incredibly realistic representation of real wood, despite being made of fiberglass, and features dovetailed hardwood stiles and rails for an integrated frame that offers unmatched strength and durability. Heritage™ – This product provides the strength and security of fiberglass, with the look and feel of real wood, and is painted with a resilient finish that will look great for many years to come. Legacy™ – This steel exterior door offers unparalleled security in either a smooth or wood-like finish, with deep shadow lines that accentuate the beauty and character of the door’s design. At DuBois ABC Seamless, we also offer first-rate patio doors, which enable you to view the beauty of the great outdoors from inside the comfort of your home, while also expanding the size of the room instantly and bringing in lots of wonderful sunlight. Our patio doors are built to maximize your outdoor viewing ability without compromising their security and energy efficiency. To learn more about our exterior doors or other renovation products we can install to help improve your home in or around Minneapolis, MN, contact DuBois ABC Seamless today. We have been included in the Top 500 list for several consecutive years by Qualified Remodeler, and have even been named to the magazine’s Top 200 Big Home-Improvement Companies, so you can trust that we will install your new exterior doors properly.